Grab the latest Sundog Song Studio coupon code to receive up to 20% discount on purchase of full license. Sundog Scale Studio (also known as Sundog Song Studio) is the song composition software for music writers. The tool is for everyone; regardless of who you are; an experienced or a beginner songwriter. With the help of the software; you can easily and quickly build song. Are you bored of the same kind of chord progressions again and again? Are you suffering from writers block? This is the tool for you. If you want to get a rid of stuffs that holds you back to create new song; then you should try the Sundog Scale Studio. You just need to download it on your Windows or Mac Pc to start exploring your song writing skill. It helps to try different chords with the same pattern. Apart from that; Sundog Song Studio also finds good chord progressions; if you are instruments are all set and ready for that song. No need to add melody/baseline/arpeggio note by note; as the tool automatically matches the chords. Song Studio for $65 – Go ahead and purchase the world’s best music creation tool for $65 (55Euro) only. It really worth the every single penny you spend. Free Download – Do you want to try the software before purchasing an actual license? Visit the link to test their Demo for free. 5years – They are celebrating 5th anniversary and offering whopping 15% discount on all their products. Please make sure to paste the code at checkout screen. It is valid for new license purchase only. Black Friday Deal – During the Cyber Monday or Black Friday; you can order a regular license at up to 20% off the normal price. You cannot combine it with any other promotion. Is It Best Music Creation Tool? The Sundog Song Studio was created by songwriter and software engineer to ease your songwriting task. All you need to connect your Sungdog with your Digital Audio Workstation (DAW) or any other MIDI software to start using it’s full features. Even if you don’t have any virtual MIDI cable; you can still build new songs with Sundog as It contains it’s own factory soundset with more than 100 instruments. It export MIDI files to other music programs. How Does The Sundog Scale Studio Work? Very first thing is to choose a basenote and a scale (i.e Major, Minor, Dorian, Harmonic Minor, Blues, Phrygian etc). 2nd step is to select a special chords. You can listen it by clicking buttons. Once you select some nice chords; then you can go ahead to create a chord progression. In your main view; you can use your mouse, pc keyword or MIDI board to create new melodies. You can switch between main view or chords view to update your chords and melodies. Built in factory rhythms, patterns and scales to make harmonic melodies easily and quickly. Hundreds of chord progression and search engine to boost your chords. It comes with so many songwriting tools such as MIDI to Scale converter, Scale Finder etc. Drag and drop standard MIDI file export. 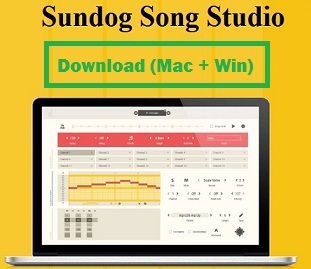 The Sundog Song Studio works for both Mac and Windows OS. Furthermore; It is available in different light and dark themes. The price of software is $65 only. The Sundog Scale Studio coupon code is rare and you cannot find it at everything now and than. I suggest to keep checking this area to find the latest special offers and a promo code. Alternatively; you should browse their official Twitter page to find same. Please don’t download free crack and null version; as It may harm your PC by injecting malwares and viruses.